Ours is a curious business. We’re contractors who provide products and services. Our work is big ticket, seasonal, geographically limited, generally recurs on an annual basis at best, product cannot be repossessed and we aim at a very exclusive target audience. That’s a quirky mix that makes advertising an asphalt business a tricky proposition. Most of us rely heavily on yellow pages, since all our customers are found in, perhaps a maximum 200-mile radius of our headquarters. Next to the yellow pages, what is our second most useful advertising tool? Surprisingly, while many contractors realize they pick up lots of business by word-of-mouth (WOM) advertising, they don’t know how to generate it or control it. 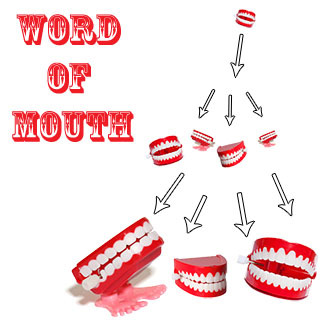 WOM is common to all product and service types. In 2006 experts call it “buzz,” or “viral marketing.” It’s all just good, old WOM. You’ve done it. You get a new car. Your neighbor asks how you like it. There you go. You visit a restaurant, later someone mentions it; there you are again, weighing in with your recommendation. Your neighbor asks your advice on where to rent a chainsaw. There you go again. You already know the answer to this. You bet it’s effective! It is the single most valuable kind of publicity you can get. It is so powerful, it cannot be purchased for any amount of money! It’s priceless! When you tell your neighbor, “Whatever you do, don’t go Cheapie Lee’s Rent-a-Saw! They’re made out of styrofoam,” what does your neighbor do? He doesn’t go to Cheapie’s, that’s what! WOM is beyond anyone’s control, isn’t it? Most people think there’s no way to control what people say. So, you just have to “hope for the best” when people talk about you? Horsefeathers! Who is writing the story they are out there telling? You actually do control what they say with your above-and-beyond customer service. Researchers tell us that about one-third of all customers of all types love to gripe to their friends when something goes wrong. A couple of pieces of pie and $50 are the cheapest advertising on earth. It’s not fair, but if you deliver as you promise, you’re not going to get much WOM. Regular, good customer service is not remarkable – as in, people literally make remarks about their experience. What’s remarkable is the service they get at both ends of the spectrum. The really over-the-top, great experience gets told to about three people. But the really nasty experience gets the customer motivated to gripe about you to some 33 people or so. So, first, if there is any kind of hiccup, delay, unexpected roadblock in the job, start doing backflips. Turn the gravy on the pants into new pants! Rewrite the whole story the customer will tell! Any time a customer complains about anything, this is time for you to cheer silently. Now’s your chance to take the wind right out of his sails and convert him to your biggest cheerleader. Charge any expense you incur to your advertising budget. It’s the best money you’ll spend. What are your employees saying? Second, keep a close eye on your daily customer service. If it’s merely ho-hum good, find ways to kick it up a notch. Top priority is your employees. If your workers go home every night and gripe about their job, and all their pals know they hate working at that crummy/skinflint/ sweatshop, you have a giant WOM problem. When you treat employees well, they not only speak well of you, they will treat your customers better as well. If your employee turnover is high, visualize what your former employees might be saying about you around town. If this thought makes you shudder, you need to rethink your pay schedules, benefits and general employee satisfaction levels. Tops on any disgruntled employee’s list is, lack of control. When your people are powerless, they’re unhappy. Empower them to make decisions on the fly, then stand behind them no matter what. When they have to run to some boss for approval on every little thing, your company is running like a wagon with square wheels. Everything is taking longer than it should, your employees are resentful and your customers are frustrated. Let your frontline guys give away new pants without stopping to ask permission! Counter with a new and improved training program! Train the power into them. Give them some guidelines and a shove. Let them get out there and do their job. Make it clear that you are on their side, and will back them up every step of the way. Now go out there and get some happy talk going on.